Not bad. Congress just got its automatic raise. The US may be in recession, but like the president, Congress isn’t hurting any. This follows the news from this weekend that Congress approved $93,000 more in petty cash for each member. The nation’s financial picture has been grim for months, but don’t worry about lawmakers on Capitol Hill. They just got a $4,700 raise. 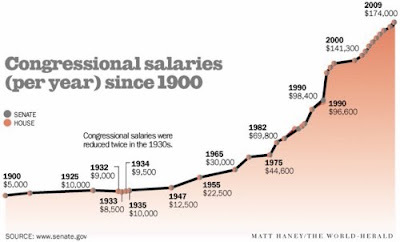 The 2009 annual salary for rank-and-file senators and representatives is $174,000, up from last year’s $169,300. The legislative pay hike comes as major U.S. employers shed jobs by the tens of thousands. Many worker salaries have been frozen or cut. Their benefits often have been slashed. Families are pinching pennies and watching retirement accounts evaporate.In this decade, Congress has allowed the pay increase to go through for every year except 2007. The percentage increase is tied to private-sector wages and cannot be more than increases granted to general federal employees. Under this bipartisan system, lawmakers are protected from ever having to vote to raise their own pay. The system, adopted in 1989, allows members of Congress to prevent a challenger from using a pay-raise vote against them at election time. After all, spending other people’s money is hard work.